No. This is not a review of Wayne Dyer’s Excuses Begone! although I am going to share with you something from that a little later. This post was sparked off by an article I read in the June 2015, Reader’s Digest, called ‘Dear Teacher,’. The articles has some priceless excuses written by parents to their child’s teacher. They were funny. Not so funny are the excuses we make for our own behaviour and choices. Or that the fact that we need to make excuses at all. 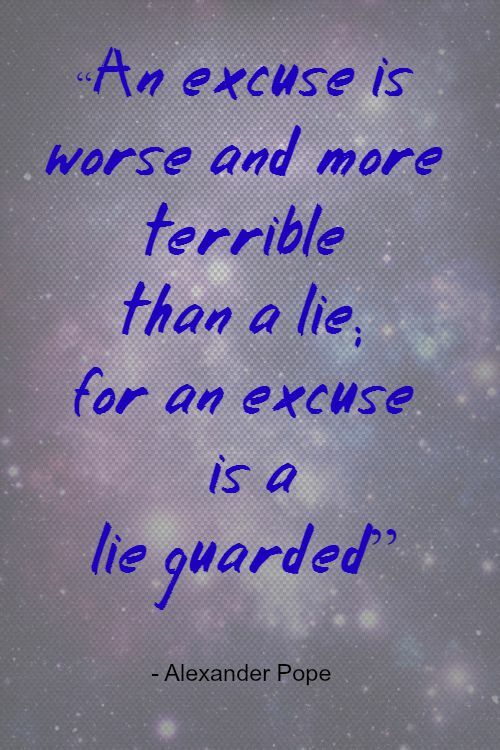 I think excuses (and I make them too, very often) are the lies we tell ourselves to avoid facing the truth about ourselves and our poor choices. The worst part is that, sometimes, we don’t even call them excuses. We believe them, entirely. Coming back to Wayne Dyer’s book, here are a list of 18 common excuses he gathered from a poll on his website when he was writing Excuses Begone! Wayne Dyer has list an affirmation for each of these excuses. As for me, I’m throwing away my excuses with an ‘Excuses Begone’ and trying to be real. Today’s linky can be found here below and my co-host is the gentle Mahati of Fantastic Feathers. Hi Corrine! Funny thing is that your name is very similar to my maiden name Rodriguez. I really like this post. Love the encouragement. Would love it if you joined my Facebook group Soul Care for the Entrepreneur. Keep blogging. Certainly an eye opener…. thumbs up for the post. I can relate to only 5 of them!! I am the one who has has heard a lot of laughable excuses from students and learnt from them to avoid as they can be easily seen through. Often I tell myself…I am too old, which is a lie, I know!! Could relate this post .A lovely read. That’s relatable! Guess I say almost all of that at different scenarios. Thanks for the article, Corinne! nice list of excuses.. i use – it’s going to be risky, will take too long time, i’m too busy a lot. Never thought until i read this post that some of the excuses become our beliefs later.